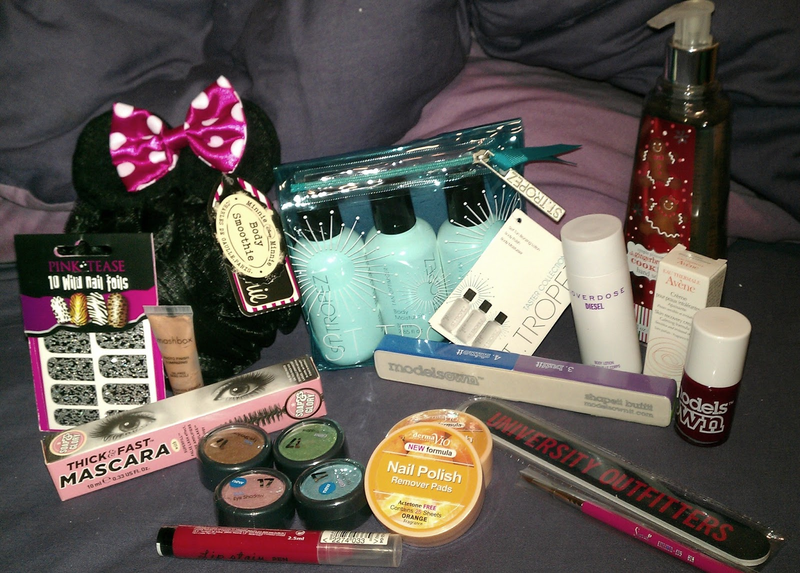 I recently took part in Chelss Chapman's beauty blogger swap on her lovely blog. Being a very active student and being in uni everyday, some days 9-6:30, that I had little money to spend. Our budget was £15 and got spending right away. I am very guilty in saying that my parcel is yet to be sent as I haven't made a trip into town to send it - but I am hoping to get it done soon (I have a Essay due next week, boo!). The lovely Rosa was the person I was partnered up with. As soon as I opened it I had a massive smile on my face. How gorgeous is this? 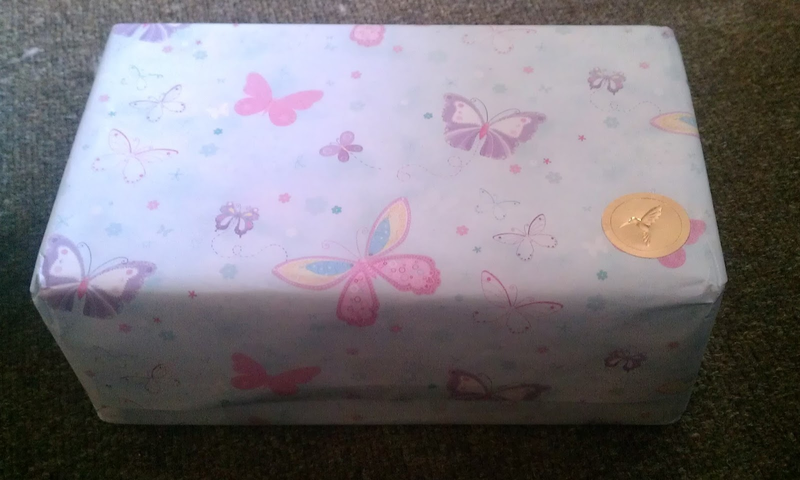 Looks so beautiful wrapped up that I didn't want to open it! But I was too curious to what was inside. After delicately opening it, I saw inside a bunch of different sized objects wrapped to perfection in purple tissue paper. I opened one by one and each one was such a lovely surprise! As you can see below, the contents of this box was WAY over £15, so it puts mine to shame straight away. I had some lovely goodies in here, each which I was in love with. Firstly a cute shower scrunchie with Minnie Mouse ears - Adorable! Pink Tease nail foils which are so cute! Smashbox Photo Finish Luminizing Primer Tester. Can't wait to try this out! Soap & Glory Thick & Fast Mascara - Too excited to try this! I was so thrilled to open this. Four 17 Eyeshadows in Walnut Pearl, Socialite, Funfair and Superstar. Not sure which is my favourite yet, I'm lovely Funfair though! 2 Derma V10 orange nail remover pads. Lip Stain pen from Primark, looooove the colour! Simple Pleasures Gingerbread and Cookies Hand Soap. It's so weird as I'm using their Strawberry Shortcake Hand Soap now, so can't wait to use this! Models Own Nail Polish in Garnet. Avene Skin Recovery Cream taster. I've used this before so this will be great for popping in my bag. Models Own ShapeIt BuffIt file - Love these! Really needed one so this will come in handy! Diesel Loverdose Body Lotion - Smells lovely! University Outfitters Nail Fail - Not 100% sure where it's from, but it screams Jack Wills. I also got some Lindt chocolates but I'm a fatty and ate them..
A MUA lipstick in shade 5, I forgot to photograph! It's a gorgeous shimmery light pink. Lastly, a cute Sigma Eyeliner in a travel size, can't wait to use this! As you can see, I am very lucky and I was given some gorgeous gifts. I really hope she feels the same. I really wish I could share with you what I got her, but I can't as of yet! I will show you some in detail very soon. Have you tried any of these? Or done a blogger swap? Let me know! Thanks for reading! I really was!! Oh I bet your well excited! I loved buying my little bits! Oh wow! Amazing! I'd love to take part in a swap! Blog swaps look so much fun! Wowweee - serious HAUL. I took part in the same blog swap - how much FUN was it! !